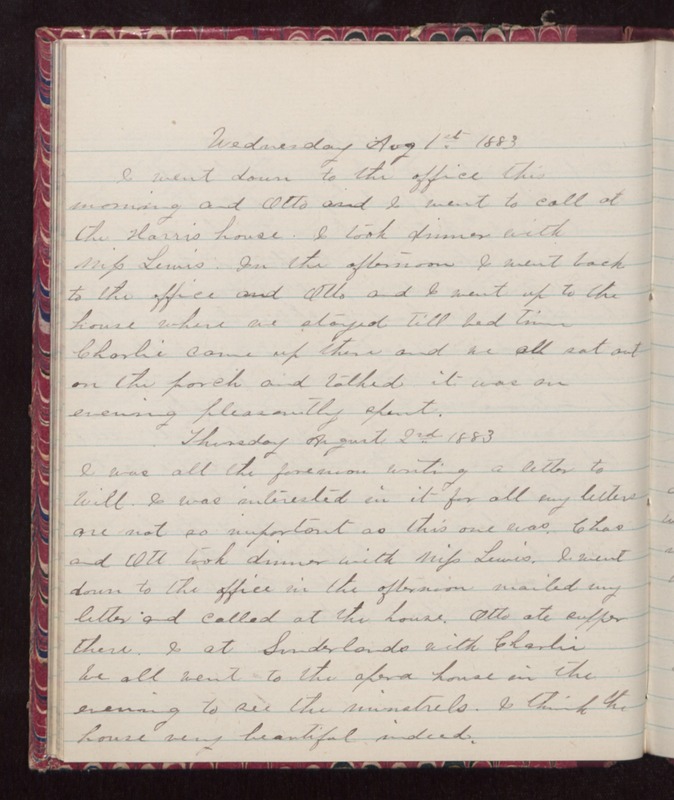 Wednesday Aug 1st 1883 I went down to the office this morning and Otto and I went to call at the Harris house. I took dinner with Mifs Lewis. In the afternoon I went back to the office and Otto and I went up to the house where we stayed till bed time. Charlie came up there and we all sat out on the porch and talked it was an evening pleasantly spent. Thursday August 2nd 1883 I was all the forenoon writing a letter to Will. I was interested in it for all my letters are not so important as this one was. Chas and Ott took dinner with Mifs Lewis. I went down to the office in the afternoon mailed my letter and called at the house. Otto ate supper there. I at Sunderlands with Charlie We all went to the opera house in the evening to see the minstrels. I think the house very beautiful indeed.